UPDATE – JAN 2014: Well, I learned most of this from my first 30 allergy shots, in 10 office visits, in just 30 days. I've made some corrections and additions over the past 4 months. Honeybee venom cannot be mixed with another venom. Paper wasp venom – ditto. Yellow jacket, yellow hornet and white faced hornet venoms can be mixed into one vial. The allergist will talk about dilutions as if you know what those are. The lab makes one "full-strength" recipe, and three dilutions of varying strengths from it. The dilutions expire quickly because very little preservative can be used (probably a good thing). The dilutions are color coded to indicate strength. Therapy starts with the blue-capped vials at 0.1μg/ml, the weakest dilution. The blue and green vials expire two weeks from the day the lab makes them up. The yellow vials expire in four weeks. The red vials are good for a year 6 months. 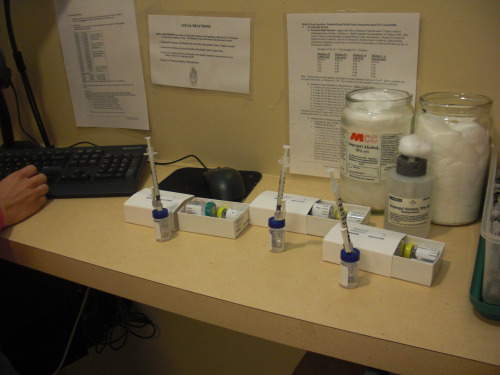 In the buildup phase, each vial contains enough for about 4 injections. The first injection is a tiny amount. The 4th injection is the greatest amount. You get shots twice a week with the blue, green, and yellow dilutions. No, you can't get shots three times a week to speed things up. Even if you start VIT the very day the first dilutions are made up, you won't get through the yellow vials before they expire. The red capped vials are your maintenance doses. Injections slow down to once a month once you've reached the red level. A red vial contains one maintenance dose. A maintenance dose is a full cc and delivers 100μg, the equivalent of 2 small stings. Blue, green and yellow vials contain different "dilutions." The shots don't hurt at all until you get to the red vials. Or the nurse administers the injection badly. During build, injections are given twice-a-week. You need to have at least 48 hours in-between getting your shots for your body to adjust. A nurse injects the venoms into your "bingo wing." The fatty tissue is preferred over muscle tissue, which can absorb the venom too fast resulting in increased swelling and even an anaphylactic reaction. Your bingo wing is more relaxed if you roll your shoulder back, and this helps the nurse give a better injection. Honeybee venom cannot be mixed with another venom but can be injected into the same arm with other venoms. Paper wasp venom – ditto. Yellow jacket and hornet venom can be mixed together, hence that vial will be labeled "mixed vespids" and the injection is given in the other arm. One visit you'll get two injections in one arm and one injection in the other. The next visit, you'll get two injections in the arm that got one the last time, and one injection in the arm that got two the last time. Some people don't alternate and are fine. 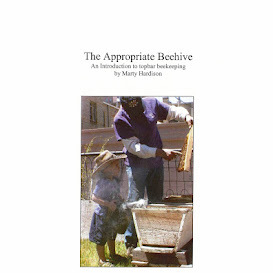 I've started taking my honeybee injection on the hip. A muffin top is a nice fatty sweet spot, which I don't have, so the nurse splits a 1cc injection between left and right. If they nick a vein, you can bruise. 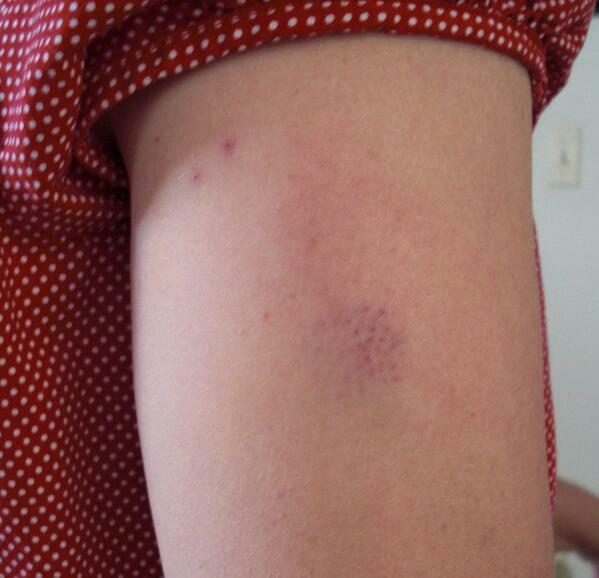 Scar tissue from all the injections can also cause bruising. After your injection, you sit in the waiting room for 30 minutes. I guess if you're going to have a severe reaction, it'll happen within 30 minutes. Anaphylaxis can still happen after you're cleared to leave, usually within 4 hours. Always carry your epinephrine pens. Redness and itchiness is normal. An icepack can help. (I might try a hair dryer next time.) You should have taken an antihistamine 30-60 minutes prior to getting your shot. Slight swelling is normal. In addition to the antihistamine you took before getting your shot, taking one after can help, as will an analgesic. And ice. Swelling the size of the palm of your hand is considered abnormal. If they see that, they'll probably give you epinephrine (the stuff in Auvi-Q and Epi-Pen autoinjectors). Ka-ching. How will they know if the therapy has worked? A sting challenge using a live bee would work but the doctor will probably order an antibody titer (blood test). Some doctors may order a skin sensitivity test but those can give a false positive. Too many shots in one arm can leave a bruise.